The Phoenix housing market is on fire, driven by strong economic growth, once in a generation affordability levels, and a surge in investment activity that far surpasses the levels during the housing boom. Once considered to be at ground zero of the housing market collapse, Phoenix has orchestrated a dramatic turnaround in recent months and has considerably outpaced other distressed markets such as Las Vegas, Riverside-San Bernardino and Sacramento. Phoenix was one of the hardest hit housing markets during the bust, with home values declining 57% from 2006 through mid-2011. Investors and Foreign Buyers: Although historically an attractive investment market, investors have flooded the Phoenix area since the downturn and now make up close to 45% of all buyers. Investor demand is so strong that first-time buyers frequently have difficulty competing with investors who are buying with all cash, often resulting in bidding wars where homes are sold above asking prices. With a current average single-family rental rate of $12,500 per year, and the selling price of a distressed home usually well below the median home price of $127K, investors can expect to achieve between a 5% to 10% annual return (after operating expenses and before any home price or rental appreciation). Competition for distressed resale homes is likely to get more challenging for buyers, with Phoenix making national headlines recently as one of the best markets in the country to purchase investment homes and enjoy favorable returns as rentals. Much of the primary home demand originates from California, while second home/ retiree demand comes from a variety of “cold weather states” in the Midwest and Northeast. Also, Canadians are increasingly flush with cash and looking to take advantage of the favorable exchange rate that has given them unusual buying power. One in every 25 sales went to a buyer that listed a Canadian address when registering the sale in February, according to the Cromford Report, a local real-estate publication. 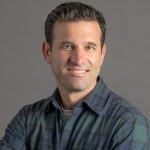 Although investors deserve much of the credit for rising home prices in Phoenix, many are concerned with the inability of non-cash homebuyers to compete with investors in many neighborhoods, particularly since mortgage qualification is so difficult. Government-sponsored loan guarantor Fannie Mae was the first bank-owned home seller to express concerns about the destabilizing effect investor dominance could have and has been pushing a program called First Look, which prohibits investors from bidding on Fannie Mae-owned homes for the first 15 days after they are listed for sale. Another tactic implemented by some lenders to make the market more fair and competitive has been to refuse all bids, either from investor or homebuyer, for a set number of days after a bank-owned home is listed for sale. Known as “initial marketing periods,” these three- to seven-day bidding moratoriums were designed to give bank-owned home listings better exposure to a broader range of potential buyers. The competitive environment in the resale market has an upside for homebuilders: primary buyers who are fed up with the bidding process and cash-heavy investors in the resale market often turn to purchasing a new home for the relatively hassle-free experience. Lean Inventory: Months of supply is now at a very low 2.4 months, down from nearly 5 months just one year ago and over 12 months in early 2008. 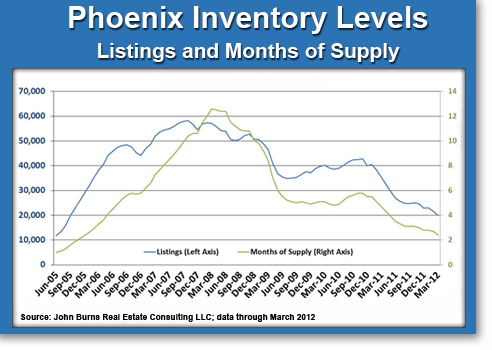 Months of supply has not been this low in Phoenix since late 2005 when sales activity was at feverish levels. 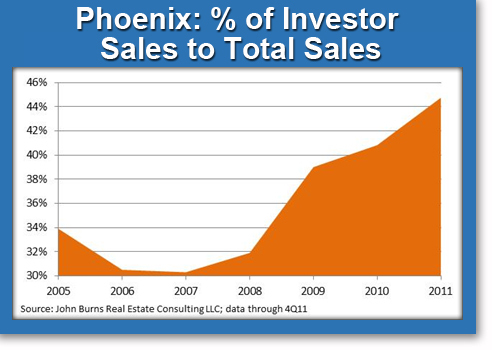 Investors and foreign buyers have helped reduce Phoenix’s housing inventory to its lowest level in over 6 years. Low inventory tends to create more competition among buyers, which has helped to stabilize prices (our Burns Home Value Index™ is up +1.5% year-over-year in Phoenix). Resale listings have fallen 43% since March 2011 and are now as low as they were at the peak of the market in September of 2005. Below are the listings and months of supply trends since mid-2005 in Phoenix. 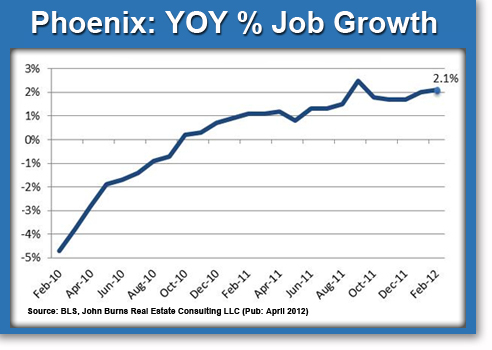 Strong Job Growth: After losing approximately 230K jobs from 2008 to late 2010 (approximately 12% of its workforce), the Phoenix metro has experienced 17 consecutive months of positive year-over-year job growth, with February’s growth climbing to a 2.1% annual growth rate. The unemployment rate has also fallen sharply over the last year, dropping to a 3-year low of 7.8% from 8.8% in February of 2011. The local economy has had a boost from several big employers like Amazon.com and Intel who have begun hiring again. Other metros with large amounts of housing distress like Las Vegas and Riverside-San Bernardino lack the economic diversity that Phoenix has, resulting in a far more restrained economic recovery. Seasonality: In addition to supply constraints and improving economic conditions as stated above, the seasonality of Phoenix has boosted home sales over the past three months. Phoenix is a seasonal market for “snowbirds” who flock to the Valley during mild winter months and then return to their primary residence during the harsh summer season. This past winter has been the “perfect storm” for home sales in Phoenix, with improving conditions as mentioned above, low interest rates, tax refunds that can be used as down payments, excellent weather, tourism, and the MLB Cactus League’s Spring Training activity that takes place in Phoenix in March. The true test of Phoenix housing market strength will be this summer, when these favorable elements subside and the housing market will stand more on its own. The above housing and economic considerations have made Phoenix one of the hottest housing markets in the country and have gone a long way in boosting demand for new homes in the area. As long as the economy grows and affordability is fantastic, we don’t see any harm caused by the investors. However, we can’t help but wonder what the investors will do with their homes when they sense the next downturn has arrived. Stay tuned!